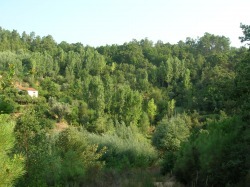 The Sustainable Forest Garden Farm Project, a permaculture earthcare venture, is based at Quinta do Boico in central Portugal. Set in a 7 hectare terraced valley we are an organic permaculture smallholding and educational center rapidly growing, quite literally, into a wooded edible landscape. Our aim is to live and share a holistic, ecological and self-sufficient life style that takes care of both our personal human needs and the delicate ecosystem that we live in. We believe that it is only by observing and learning from natural ecosystems that we can find a sane way forward in this time of planetary crisis. We feel that the only way we can successfully feed ourselves in the future, as a species, is to establish food forests in our communities and landscapes. Quinta do Boico is a living example of what can be achieved. We initially planted up a small forest garden, in an existing pear orchard, when we bought the farm more than 12 years ago. Because of this climate, with its hot summers, we quickly reaped the benefits of mimicking a young, natural forest ecosystem. 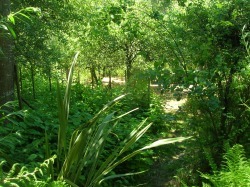 The forest garden was both beautiful and productive and it convinced us that this was the way forward for us. We have had a head start here, as the farm had been a thriving fruit farm lovingly tended by a couple who obviously had a deep connection to and love of this land for over 50 years. In the years since, on the rest of the farm, we have continued to plant trees, and allow self seeding, in amongst the existing wide variety of edible and native species .We soon realised that the entire valley was turning into a forest garden. It feels like a very natural evolution of the land. In the last few years we have become inspired to continue the work. It seems to make sense on many levels to plant up the land for human needs, both physically and spiritually, and ultimately will mean less work for us, as the system will become more and more self sustaining in many ways. Such a system will also meet the needs of the wildlife and allow space for the return of a self balancing ecology to return. We don't know what the future will bring but sustainable resources have to be a part of it.We believe that it is crucial to plant trees and useful edible polycultures and try to take a long term view of the land and the needs of following generations.We need to act like we are the ancestors and leave behind us a place better for our passing. The first step was to draw a map of the area and start to plan our design. We placed the trees and plants that were already there and then drew in positions for the many cuttings and transplants we already had. 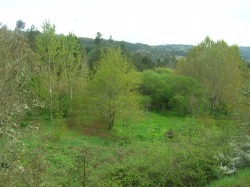 In the autumn of 2008 the brambles were cleared and the land prepared for planting. After browsing through listings of edible and useful trees and shrubs we came up with a list of potential buys. A visit to a local nursery made us realise that we were going to have to design for what was available, initially, and that the planting would evolve according to when we could acquire the rarer species on our list. We were fortunate to be given a grant for tree planting and bought 45 trees which were planted out, with more to come. Some of the larger trees are in place and we have the watering system installed now.We are currently continuing with other elements of the FG. It's just a beginning and an ongoing project which will take some years to complete but we are enthusiastic about the possibilities we see for it. If you are interested in being part of this project or volunteering please see our Visiting/Help page. We want to show the enormous potential for meeting our needs directly from the land and offer that vision to others who may want to do similiar things in their areas.We now offer permaculture courses and forest garden modules here, where students can live amongst permaculture in practice and experience for themselves the beauty and abundance of such a design. We are also offering a one day Introductory Course to Forest Gardening, please see the events page for details. Sustainable Living workshops that focus on certain aspects of our lifestyle and skills are run in season so that participants are learning in a natural context. Guided Tours are available which last two hours. Dates are posted on our Events page but please contact us if you want to come outside of the advertised dates. There are four quite large terraced fields which lie along the bottom, of our part, of the valley and terraces which run up either side of them, this is the area we are planting the forest garden in. 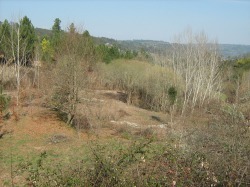 The valley continues down to join the main river valley through which the Rio Mondego runs. It is a unique and special site, sheltered and beautiful to be in. We hope to keep track of the work on the forest garden in our blog pages but this will be an on and off thing as we don't have much time to spend on the computer, or in the winter, much spare solar energy for it. However we will do our best! Please keep looking.